Therapists that do Lymphatic Drainage know exactly how difficult and tedious this system is to treat with compression work. Cupping does the opposite. Cupping stretches open, rather than closing the lymphatic vessels. 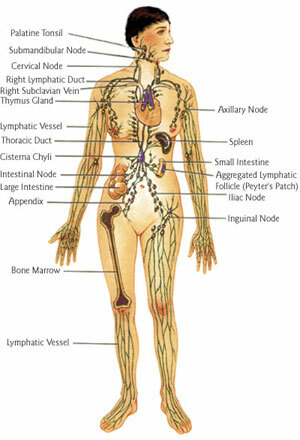 This action actually increases the movement of lymph locally and systemically with cumulative treatments. Increasing Lymphatic output increases the immunesystems ability to detoxify the body and respond to stressors put onto it from disease, chemicals, stress and electromagnetic fields. Successful MFR stretches the fascia away from the underlying structures. Also occurring along the fascia are Trigger Points. Trigger Points are twisted bundles of fascia that are extremely sensitive to palpation and feel like tough, dense knots along the muscle. Trigger Points cause injuries over time because they break up the normal structure and operation of the fascia. With negative pressure, the fascia is gently stretched and unwinds without the discomfort of force.